Hello again. The NSW club Concours was held last weekend and was a great success. I attended with the ML270 and took out second in class! This newsletter we have the full details for the ACT club concours and some more cars for you. Don't forget, that to check out any of the pictures in full size, just click on them. As mentioned above the Mercedes-Benz Club of New South Wales held their Concours on the 8th of September and details of this event can be found here. This was NSW's clubs 30th year and they certainly went all out to celebrate. My estimate are that there were over 300 cars in attendance and 92 of them were entered in the Concours. I am very proud to announce that the Outright winner was one of our Customers cars. A 1955 220a that was restored with help from our workshop. Pictures of the car can be found here. I have over 50 shots that I will be posting as soon as time permits here. There were two very unique cars in attendance. A 1912 Benz W5 and a 1916 Benz. There were also two Gullwings and two rare 280SE 3.5 cabriolets. 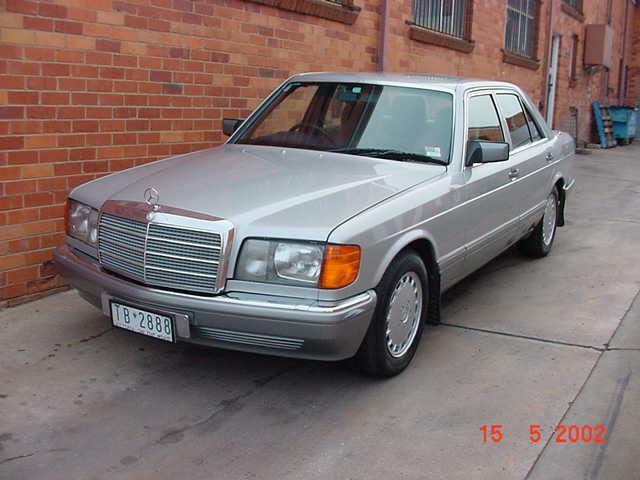 The Mercedes-Benz club of the ACT are holding their 27th Annual Concours on the 22nd of September. The ACT club concours is held in conjunction with the Shannons German Autofest and details can be found here. See below for more details. 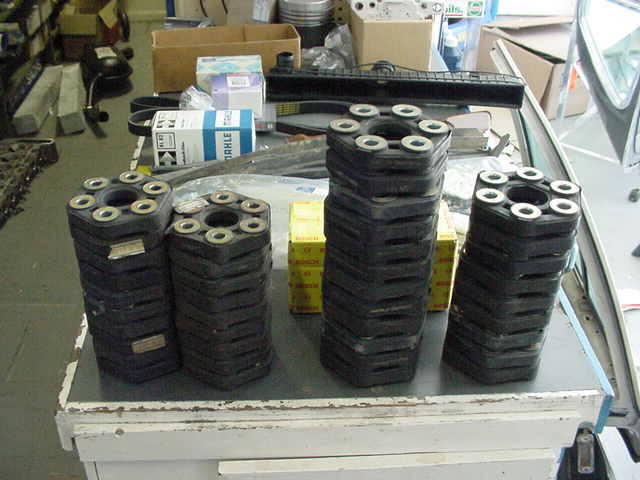 We have just landed a bulk order of the older style tailshaft couplings for the 50's and 60's models. These normally sell for between $110.00 and $150.00, but we will have them on special for the next month at $80.00 each. We have both the small and large ones in stock. Ring us on 1300 787 300 or e-mail us at spares@mbspares.com.au if you are interested. > and he then sends a hard copy of your data card. It seems the info on data cards is getting so much easier to get. I will soon do a revamp of our Data card page to include all these new ways of getting your card. 1. Sunday, 22nd September 2002 is the date for the 27th Annual Concours d' Elegance of the Mercedes - Benz Club of the A.C.T. As in recent years, the event will be an integral part of the Shannons German Autofest. 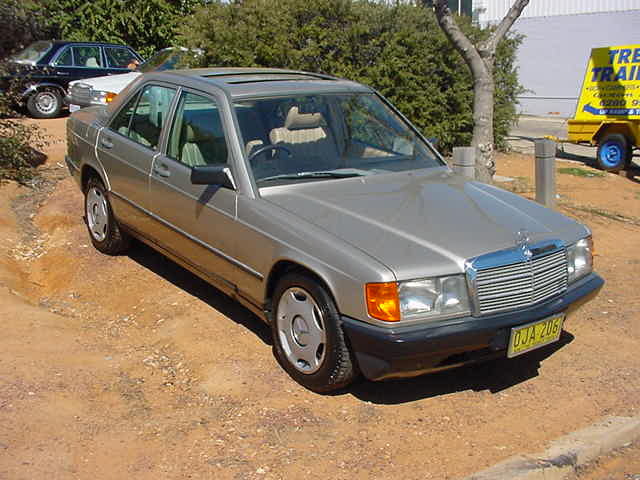 We hope that Canberra's superb spring weather will attract visitors from neighbouring clubs with their Mercedes - Benz vehicles to compete or display. Combined with opportunities during the weekend for touring through some of the most attractive country in Australia, you can also enjoy the national capital and get thoroughly social with other Mercedes - Benz enthusiasts. 2. The pre-concours dinner on Saturday, 21 September 2002 will be held at the Southern Cross Yacht Club, Marina Place, Alexandria Drive, Yarralumla (tel. 6273 1784) and a map of the club site is enclosed. Cost will be $33 per person for a 3 course meal, with finger food on arrival. Drinks are an additional cost and are payable as you order. 4. This year the concours is being held on the Rond Terraces overlooking Lake Burley Griffin and at the end of Anzac Parade, a major ceremonial road in Canberra with the Australian War Memorial at the other end. The venue will be accessible via Parkes Way from the direction of Kings Avenue and Club representatives will be on site to guide you. A map of this site is also enclosed. The High Court, the National Gallery, the National Library, Parliament House and the new Federation Place are all visible from the Rond Terraces, and Floriade is just 200 metres away. This area is a little bigger than the previous display area of Section 34 and should prove to be a better venue in many ways. 5. To help with the smooth organization of the event, we ask that our local and interstate friends alike declare their intention to enter the Concours or to display their car by filling out the enclosed registration form and sending it back no later than 10 September to the Concours Director, Peter Mulquiney. Please include the $5 per vehicle entry fee for judging. Those competing or displaying are asked to arrive between 8.30 - 9.30 am. 6. For several years our Concours has been run in conjunction with displays by other German motoring clubs in the A.C.T. Much appreciated financial and moral support from Shannons Insurance Corporation, and the Italo - Australian Club allows the combined German motoring clubs in the A.C.T., with support from some marque dealerships, to once again stage the Autofest, a public display of historic, classic and modern Audi, BMW, Mercedes - Benz, Porsche, and VW cars and BMW motorcycles. 7. We also welcome vehicles from other German marques no longer in production such as NSU and DKW, and this year we are anticipating up to 20 of the "rare marques" to be on display along with over 160 other motor vehicles and motor bikes. 8. The rules governing the conduct of the A.C.T. Concours d' Elegance are included in this publication. If you have any questions, please ring the Concours Director, Peter Mulquiney on (02) 62420704 (h). Questions on the pre- concours dinner should be raised with the Social Director, Anne Maddern on (02) 62881892 (h) which is also the number for the President, Daryl Maddern. 9. Concours d' elegancing goes back to the time when true coach building was the order of the day, and the "haves" paraded in finery to match their Broughams and Victorias. In later years, these events have been superseded by the mechanical age and the likes of Pebble Beach in the USA. - daunting stuff but not that of the true enthusiasts' concours exemplified by the car movement worldwide. 10. 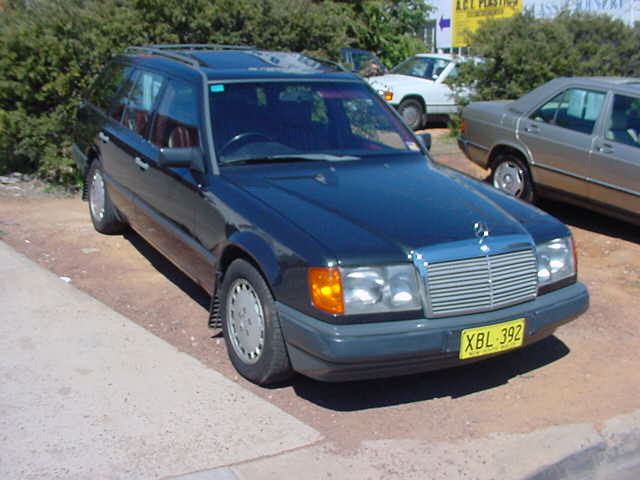 Mercedes - Benz clubs around Australia represent the real spirit of motor enthusiasts, none more so than the A.C.T. Club which has staged an annual concours since its formation in 1976. Like all other authorised Australian MB Clubs, we welcome interstate visitors and competitors and acknowledge the strong support we have received for many years from N.S.W. and Victoria. 11. Our concours, like many others in the club movement around Australia, recognises that people don't possess the special cars that are a feature of the big overseas events. What Australia does have is a rich motoring history. The A.C.T. Club has designed a concours structure and rules which encourage competition between cars used every day, as well as the rarely used and rare. Thus there is nothing to prevent your car winning on the day. 12. Entry is open to financially current members of a recognised Mercedes - Benz Club. The vehicle entered must be owned by or legally the responsibility of the members entering that vehicle. To be eligible for judging for awards the vehicle must have travelled a minimum 10,000kms since new. The Concours Director must receive the completed entry form and appropriate fee no later than 10 am on the day of the concours although earlier notification would be appreciated. The acceptance of any entry shall be at the discretion of the Concours Director and the Chief Judge. Trophies are awarded for various classes within these divisions, with further trophies available as listed later in this section. All decisions about awarding trophies will be made by the Chief Judge, except for the President's Award, which is at his or her discretion, and will be final. If the Chief Judge becomes aware of a disputing arising, or likely to arise, within the judging team or if the ranking of vehicles is very close, the Chief Judge may seek the advice of statutory A.C.T. Club Committee members present. 14. Road Division. There are six trophy classes for Road Division as shown in the table at the end of this publication. To be eligible cars must qualify by completing a specified distance since the previous concours. Proof of mileage may be required. These cars will be judged on those aspects that would be visible if parked on the street (i.e. paintwork, chrome, tyres etc.) At the discretion of the owner, the car may be entered for the engine bay awards. Winners in Road Division from the previous year will be required to compete in Club Division. 15. There is a minimum standard for a win in any Road class. If no car within a certain class achieves this standard then the Chief Judge, subject to paragraph 13 above, has the right not to award a trophy. 16. Commercial class is competed in only for Road Division. Eligible vehicles must be dedicated commercial vehicles. No deductions will be made for vehicles with sign writing. Modified vehicles are ones that have been significantly modified from the original design. Specifications of modifications may be requested by the Chief Judge to decide if the vehicle is appropriate to enter this class. 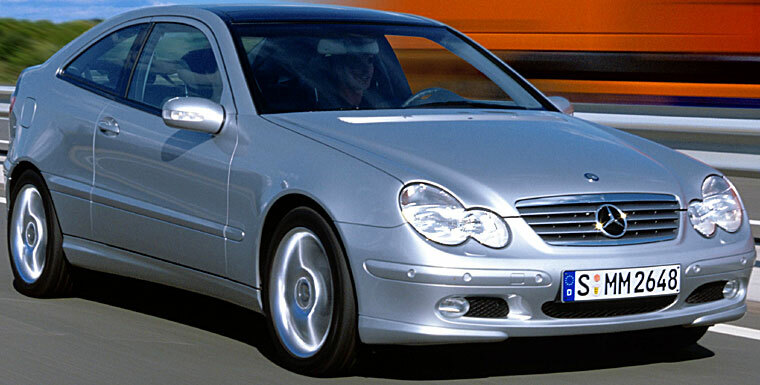 Official Mercedes - Benz approved AMG models are not regarded as modified cars. 17. Club Division. There are 15 trophy classes for Club Division as shown in the table. There is a minimum qualifying distance of 500 miles ( 800kms) to be travelled in the year. All aspects of the car will be judged according to our " Standard of Presentation" statement below. Club Division winners from the previous year will have to compete in the Champion Division. If owners wish to continue to compete in Club Division they will have to travel the qualifying distance for the equivalent Road Division (eg. a W116 which won in Club Division in the previous year must do 10,000kms to compete again in Club Division). 18. There is a minimum standard for a win in any Club class. If no car within a certain class achieves this standard then the Chief Judge, subject to paragraph 13 above, has the right not to award a trophy. 19. Champion Division. This is our "Champion of Champions" Division. Entrants are the various winners from Club Division the previous year that have not completed the required distance to continue competing in Club Division. Cars are judged on the same basis as Club Division and the winner will be awarded the Mercedes - Benz ( Australia ) Champions Trophy. 20. Display Division. This is the non- competitive Division where we encourage the display of cars that do not meet, for example, distance criteria. " Museum" cars, or cars which are specifically kept for display and do not get driven, or newly restored cars, are examples. Through their display we can all admire their beauty and the attention to detail expended on them. 21. Trophies. Trophies are awarded for various classes within the competitive divisions and for Outright Winner and Runner - Up of the Concours. There is also a range of trophies for engine bay, interior etc. 22. Engine Bay Awards. There are two awards for best engine bay - " Simple" and "Complex". The Chief Judge will make the defining line between the 2 awards on the day. 23. Distance Award. The distance to Canberra from the member’s registered vehicle garage calculates a distance award "as the crow flies". 24. Best Paint Finish Award. A recent respray won't necessarily beat an excellent original paint finish. 25. Best A.C.T. Vehicle Interior Award. This is for an A.C.T. member's car and is judged by one of our interstate visitors. 26. Life Members Encouragement Award. This is awarded by the consensus of Life Members present on the day or, if there are no Life Members present, then the award is to be judged by the Chief Judge subject to paragraph 13 above. It is generally awarded as an encouragement for a car that has not been successful in its class. 27. Outright Winner and Runner-Up. The Outright winner is for the highest score of any entrant including Champion of Champions, and the Runner - Up is for the second highest such score. 28. President's Award. At that person's discretion. 29. The standard of presentation is that the car is to be displayed in as close a condition as it was when it left the showroom. Judging is divided into a number of categories as follows. 30. Exterior. This includes paintwork, chrome, glass and lenses. Our attitude is that a well maintained original finish is just as good as a new respray. Obviously if the old paint is buffed through to the primer this does not apply. Stone chips that have been filled and repaired are acceptable. Chrome bumpers should have the correct finish on the inside. All lenses should be clean and unscratched. 31. Interior. This includes all the interior except glass. Judging is based on cleanliness, completeness and originality. Clean under your seats and under the carpets. Non - genuine radios are permitted so long as they suit the age of the car and other accessories must also be appropriate for the car's vintage. 32. Underneath. This is where we differ from some other clubs' concours rules. As many of our entrants need to travel great distances to get to our concours we look to see that underneath was as clean as when you left home. Under the guards in the wheel arches should be as clean as you can get them at your Canberra accommodation. But the odd spot of tar and road grime in the floor pan and tunnel area will not be penalised. Make sure your lower suspension arms are clear of stones. Tyres and wheels should be clean inside and out. 33. Boot. Boots should be neat and tidy with an original boot mat. The spare tyre must be consistent with other road tyres, and be clean and in roadworthy condition. Available for inspection with owner in attendance should be keys, logbooks, owners’ manuals and tool kit. Underside of boot lid should be painted as per original specification eg. generally black or grey depending upon model. 34. Engine Bay. This includes everything seen and " checkable " with the bonnet up. Engine components should not be polished or chromed. Aluminium surfaces should be bead blasted, not silver frosted. Points will be deducted for incorrect hoses, battery clamps, ignition leads etc. If your vehicle is fitted with a bonnet sound-deadening pad it must be clean and not oily. If car alarms are fitted they should be discreetly installed. 35. General. Overall, our definition of the perfect car is one that is both well maintained and extremely clean - as it was when it was delivered to its first owner at the show room. With age taking its toll on all cars, it will be the best cars in their class on the day that wins. 36. While we have mentioned the word "original" several times, we also acknowledge that claiming a certain part to be non-genuine can open a "can of worms". It is our policy that, should a question of originality decide between a win and a loss, the Chief Judge will consult the club member beforehand. 37. All sections will be judged in Club and Champion Divisions. Road Division cars are judged to the same standard but only the exterior and wheels are judged. While the interior and underneath of the car are not judged they are expected to be in above average condition. In the event of a tie for a class win for Road Division the interior will be judged. 38. Clean all glass with a single sided razor blade, especially the edges against the window rubber. Clean side windows with the window down a bit so you can clean all the way to the top. 39. Wash difficult panels of your car down with Prepsol (single panel at a time, wipe off quickly) before polishing it to remove tar spots and other road grime (Prepsol is available from Allard Auto Paint, an A.C.T. Club sponsor). 40. Park cars with wheels straight ahead, seatbelts neatly displayed, and all logbooks, keys, and owners’ manual are ready to be inspected. This makes a good impression on the judges. 41. Don't use black paint on tyres. After many applications it cracks and looks dreadful. Use a silicon tyre treatment or, even better, just a good detergent. Don't forget tyres have 2 sides and wash them both and check them when you get to the concours. Also, don't be tempted to paint the boot mat with black tyre paint. 42. Remember that judges have fingers as well as eyes! Clean everywhere that a judge could stick his or her finger - eg. inside lip of mudguards and under air cleaner. 43. Make sure all radiator hose clamps are the same brand and are pointing in the same direction. 44. Clean under the seats on the adjusting rails. After cleaning apply a small amount of white grease. Clean the excess grease around door hinges. 45. Entrants who have not registered and/or don't have their car in place by 10 am will not be judged. 46. Judges will not go looking for owners to open a car where this is relevant so either the owner must be beside the car or it must be left unlocked. 47. Cars with either a soft-top or hardtop should have the soft top displayed in the raised position. 48. No points will be deducted for non - German first aid kits, but all first aid kits should be stored appropriately for the model. 49. No points will be deducted for upgraded fire extinguishers. 50. Seat covers must be removed for cars in Club Division or for Outright awards, otherwise a 50% points deduction will be made for the interior section. 51. The Chief Judge can, at his or her discretion, combine classes where there is a poor attendance or split large classes. 52. Judges are to set a standard on the day by ascertaining the best and worst cars and judging everything else in between. 53. It is considered bad form to "check out" the judging form on your car whilst judging is underway. Judges come back and mark the score either up or down depending on what other cars look like. 54. Remember, come along and enjoy yourselves. The real winners on the day will be our respective clubs, which aim to promote the Mercedes - Benz Marque ! The whole idea is to get as many of us together with our vehicles as possible. So please, remember that all vehicles are well regarded, and if you wish to compete as well as display, you can always enter in Road Division. Each year German Auto Fest supports a local charity and helps them to raise funds. This year the GAF is supporting the A.C.T. branch of SIDS and KIDS. They have been very helpful with publicising our event so it would be great if you could attend the German Auto Fest with a view to helping out this very worthwhile charity. Martin Cutler, Chai Theo, Stephen Lawler and I all attended the NSW Concourse last weekend. A great time was had by all. It was especially great to see Chai who had driven up from Melbourne to be there. Here are some pictures of us and our cars. Continuing on the Concours theme, here are the results of the NSW club concours on their website. We have put a temporary hold on buying cars for dismantling. Why? Rear the next newsletter to hear about a very exciting development in our business. The low mileage 190E has arrived. It is a great car with sunroof and electric windows. It has travelled only 68330kms and has been serviced 16 times! Each service has been done by a MB dealer. That's an average of only 4200kms between services. We also have a 87 300E coming in later in the week. The big news is that the hearse is SOLD. It has gone to the new loving owner in Melbourne. he brought it because it was shorter than most of the Hearse made on US based cars and would fit in his garage!